Innovative style and durability meet in the sleek all-steel Madison Collection park bench. These 'Industrial Chic' 4', 6' and 8' park benches utilize commercial grade materials and fashion forward design elements to create eye-catching, versatile seating. The bench seat is crafted with slight contour utilizing 5" Ipe wood slats, reinforced with 1/4" support ribs and tied together by a strong 3/4" steel frame. 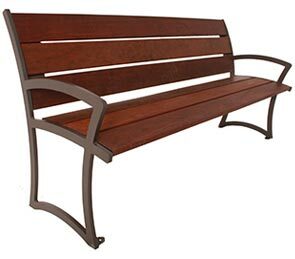 Completely MIG welded and finished in an ultra-durable weather resistant powder-coating, the entirety of these premium park benches are developed to offer long-lasting performance and enjoyment. With a frame footings design that allows for both portable and surface mount capabilities, it's an easy choice for offices park walkways, retail store settings and lobby installations.